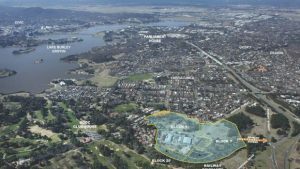 Members of Weston Creek Community Council will raise concerns about a roundabout planned to link the Canberra Brickworks precinct to a busy thoroughfare at this week’s meeting. The roundabout plan was submitted in October last year as the best option for a new access road connecting the brickworks precinct to Dudley Street. Under the feasibility and concept design report prepared for the Land Development Agency by Cardno, it was recommended the roundabout be built close to Dudley Street’s intersection with Cotter Road. The $7.5 million concept, which included a right-turn-only lane into the new access road from Dudley Street westbound, was preferred over a tee intersection. Dudley Street itself would need to be widened from the existing six metres to 10 metres to accommodate the increase in traffic and a pathway. Weston Creek Community Council chairman Tom Anderson said he was concerned the project would lead to further problems along Dudley Street. He said the matter would be raised at the council’s public meeting on Wednesday. “This road is almost at capacity during peak periods and queue-backs exist up to 100 metres,” he said. The feasibility report found the construction of the roundabout with a dedicated right turning lane into the access road from Dudley Street westbound would lead to Dudley Street delays of 5.1 seconds in the morning peak for traffic to the city and 5.2 seconds on the return trip in the afternoon. Optimal delays at traffic signals and roundabouts are considered to be less than 14 seconds on average per vehicle. The estimated two-way traffic volume of the access road to the brickworks precinct was 2221 vehicles per day, while the Dudley Street upgrade would bring the road to a standard allowing for more than 8000 vehicles per day. “The upgrading of Dudley Street between Novar Street and Cotter Road will improve safety for all road users, include added provisions for public transport, on road cyclists and an improved path network,” the report said. Tenders for the Canberra Brickworks redevelopment closed on January 20. Doma Group and a consortium of Coda Property Group, Lendlease and Canberra Contractors were shortlisted for the restoration project. The winner will be announced later this year. Community concern forced the government to scale back the vision for the precinct in 2015. The development area has fallen from 49 hectares to 16 hectares, leaving a substantial nature strip between the project and the Cotter Road-Yarra Glen interchange. Under the former plan, Dudley Street would have been cut off from Cotter Road, with the intersection incorporated into the precinct. The access road through the nature strip was suggested as a way to take pressure off Denman Street and allow residents to flow through to Cotter Road and onto Adelaide Avenue through Dudley Street.